Boating On The Hudson & Beyond magazine for over 13 years. He is featured on the May 2012 cover. "We'll keep you looking good on the water!" 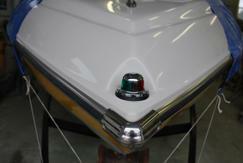 If boating is your passion, we will keep your fiberglass vessel looking good season after season! Fine quality fiberglass and gelcoat repair is an art that requires many years of experience, dedication, time and patience. Our consistent high quality work is performed by skilled composite craftsmen with over 40 years experience. 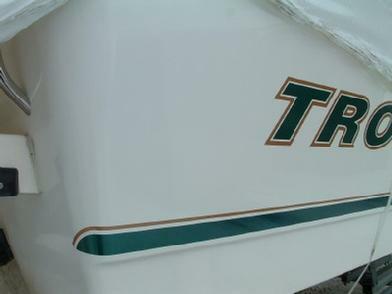 Damage to your fiberglass boat can be caused by unfortunate collision, dock, rock, wind, storm, trailer, expected "wear & tear", the sun and weather elements, family members, etc! However the damage occurs we can repair,improve the looks and extend the life of your new or "seasoned" investment. 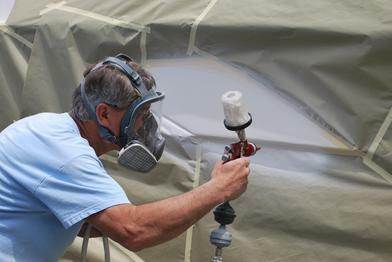 Repair service- We can provide certified fiberglass, gelcoat and multi-color polyflake boat repairs, restoration, refinishing and custom gelcoat color matching. 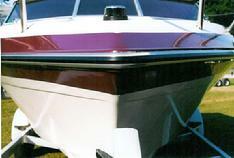 We offer pinstriping/bootstripe,carpet replacement & pontoon boat furniture replcement. Our trained experts repair all minor & major gelcoat,fiberglass & polyflake damage including holes, cracks, chips, airpockets, scrapes, gashes,spider cracks or "crazing", osmotic blistering a.k.a. 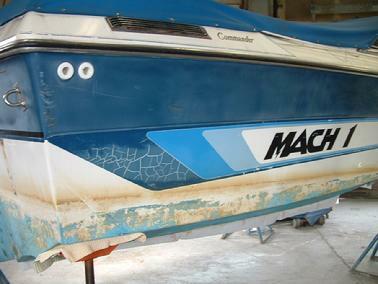 "boat pox", scratches, "dock rash" and delaminations. 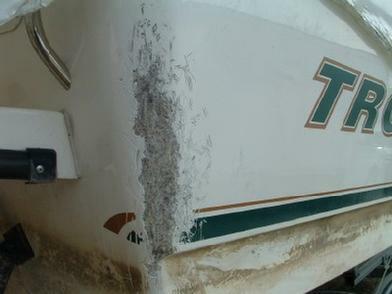 If your boat has any type of fiberglass impact or structural damage, fractures, transoms we can help. Have dull,chalked,faded gelcoat color? Let us rejuvenate it with our color restoration process! Consulting Service for Manufacturers, Dealers, Marinas,Yacht Clubs & Repair Facilities- Are your gelcoat repairs not to the standard they should be? Frustrated with failed and ugly repairs? Dave can help you achieve quality and successful repairs. We can make arrangements for him to come to your site and oversee your shop procedures. Call us please for more information. What's under your bottom paint? Bottom paints hide a lot; We've seen it! 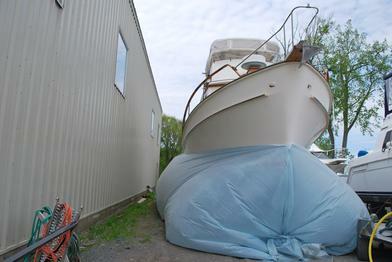 It covers previous repairs, osmotic blisters,cracks and other typs of hull damage. 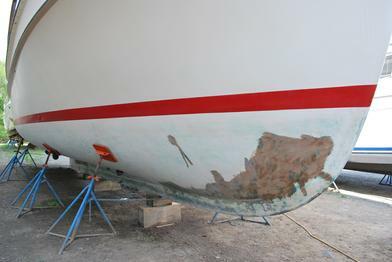 I have seen many bottom paints that have not been properly applied - flaking off and exposing a hull to water absorbtion and eventually potential osmotic blisters and hull failure. 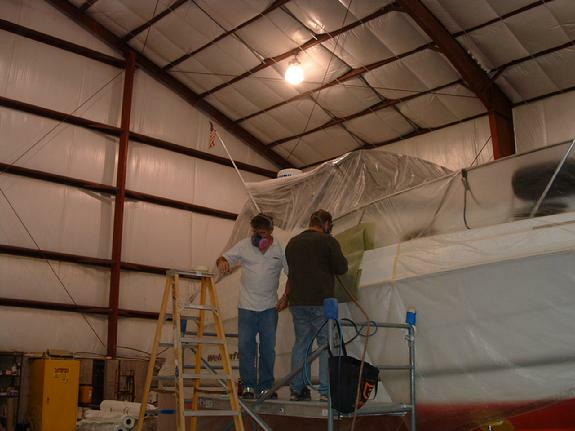 Heavy amounts of bottom paint on a boat weighs alot and will slow it down cutting fuel efficiency. 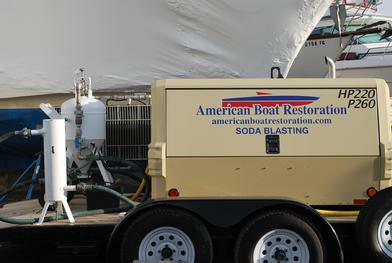 Our Soda Blasting is the best Bottom Paint Removal system. It is Safe, Clean & Environmentally friendly! 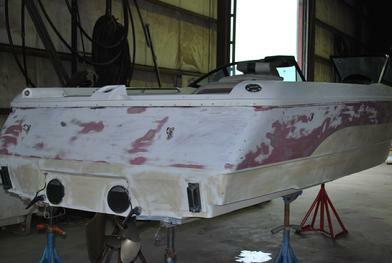 During the bottom paint removal process we can professionally access the condition of your hull. 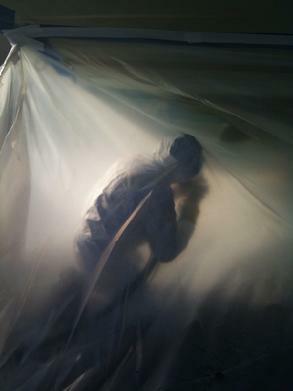 We do more than just soda blast the paint off, we get to see every square inch of it! We can offer the best advise on how to keep your hull in great condition. 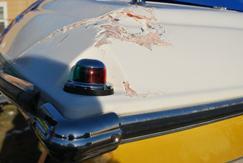 With over 40 years experience we know how to correctly perform any type of fiberglass repairs if needed! 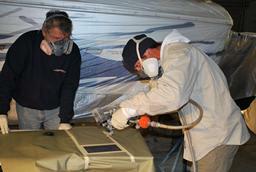 Please note -After the hull is soda blasted it must be prepped correctly for the best epoxy barrier coat adhesion. 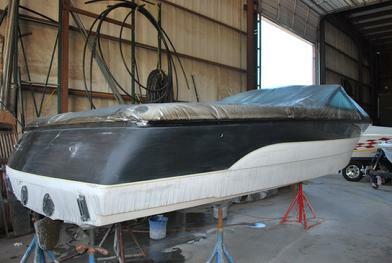 Soda blasting alone will not prep a boat for epoxy barrier or bottom paint. It must be sanded with the proper grit sand paper. Epoxy Barrier is a primer for bottom paint and provides the best protection against water intrution and the development of osmotic blistering. 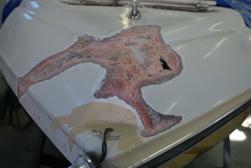 We highly recommend epoxy barrier on all hulls that are kept in the water all season. 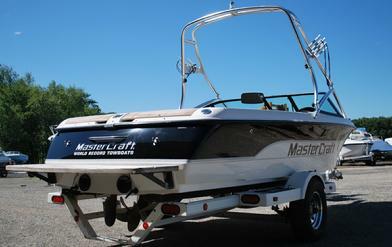 Manufacturer Warranty Repairs - We are an Authorized Repair Facility for many boat manufacturers. Insurance Estimates - We work with all insurance companies furnishing them with important repair estimates and digital photos of damages as quickly as possible. The process of an INSURANCE CLAIM varies with each company. * Get the insurance information, names and addresses from the other party or parties involved in the accident, as soon as you sustain the damage. This could be another boat, a marina or another third party. Save this information. We suggest you take pictures as soon as possible. We will also take photos during our evaluation. The claims representative from the insurance company may also take pictures, but it doesn't hurt to have pictures that you've taken immediately after the incident. Call a claims representative from the insurance company to make your claim. The claims representative may come out to see damage and help you fill out the claims form, which will allow you to tell your side of the incident. 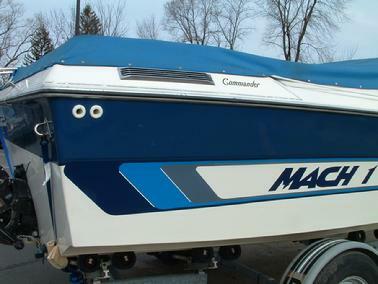 We will submit to your insurance a written estimate of what it will cost to repair your boat including photos. We provide as much detail as possible so the insurance claims people can fully understand the nature of the damage and the repair process needed to be done. Most insurance companies will cover transport cost to repair facility and back. Insurance company will review repair cost and if they have any questions will contact us. Wait for your check to arrive from the insurance company. This may take only a few days or weeks. It will be processed only after all of the claims forms have been filled out and your claim has been approved. Receive your check from the insurance company, which you can then use to repair your boat. We make every effort to get you back on the water as soon as possible! Need advise? We'd be happy to answer any questions you may have regarding a potential purchase, care of your boat and/or referrals for your other boating needs. 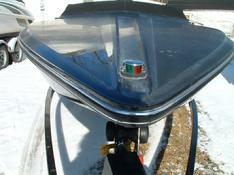 "We have been serving boaters for over 40 years. We're boaters ourselves! " Thank you for taking the time to visit our web site. We look forward to helping you! We use the best Compounds & Sealer Glaze available at DYNAGROUT,INC. 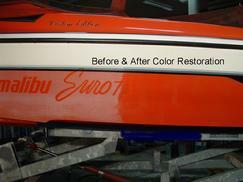 "Thanks so much for the top quality, professional work you have done to restore my boat. It is now 15 years old, but looks like new! I'll be proud to recommend you to others! " "Thank you all for for helping us with this boat that I have been waiting my whole life for - Your the best!" "Thanks so much for the work on our boat - Once again you came to our rescue - thank you!" "Thank you for the great job as always!" October 2004 "Ways to make an old boat new again"
taught by Dave Weakley aka "Dr Gel"
He will teach you the proper techniques backed by working in the trade for many years. "Your knowledge and the quality of the materials you use will lead to successful repairs!" Personalized small class size training! You will learn the right way to repair boats. Expert Color Matching is a key part of our training program. We know how to achieve a great color match. If a repair is not a good color match it'll be a "patch" not a successful repair.
" I thought you would get satisfaction how your life has affected another in the gelcoat world. I never would have attempted or considered doing this job if our lives had not crossed. Every time I gelcoat I am reminded that my beginnings were because of your kind sharing of your knowledge and experience. I a way a part of you is on my boat"
"I can't even begin to thank you enough for your class! After losing my partner, who did all our Gel-Coat work, I was certainly concerned as to who would finish our repaired projects. After taking your class I am able to turn out better work than we had in the past and without all the problems we had been having. You not only provided excellent hands on training but also explained what we were doing to cause the problems we were having in the past. We are now turning out a better product than we ever had! January 2017 Student " Loved it. It was a steady flow of information every second of the day. I not only learned a unbelivable amount, I had a great time. Exceeded by far my training expectations"
The photos on our web site are of repairs done by us, American Boat Restoration. We can prove it. In the past some images have been stolen and posted on other web sites. We successfully shut down one web site who stole our photos. Another site was made to remove them. If you see any of our images shown on another web site please contact us - boatrepair@aol.com Thank you to those who have alerted us! Although flattered, we are not happy! Bow pulpit in need of a repair gone bad. 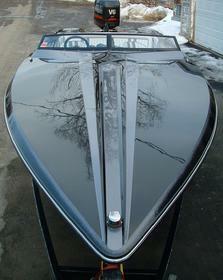 We call this a "patch"
Ski Nautique was completely restored inside & out. Additional images of repair process are available. 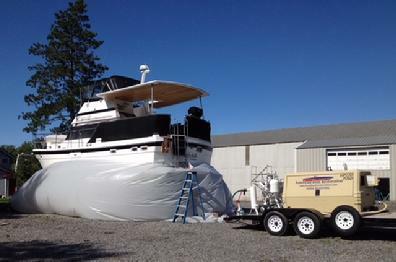 American Boat Restoration Mobile Soda Blasting Service --- With over 40 years of gelcoat and fiberglass repair experience I can expertly determine any problems you may have with your hull. Soda blasting removed hundreds of lbs of old bottom paint. The hull was examined carefully- note previous repair was unknown to boat owner. He was happy to see the repair was done correctly. 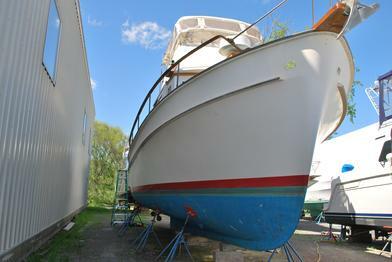 Hull was sanded and is ready for epoxy barrier and new bottom paint. 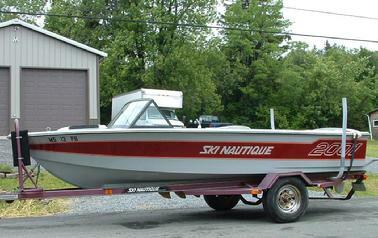 Gelcoat color restored,new decals & ready to hit the water! 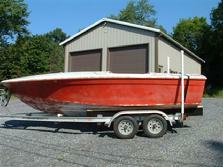 Copyright 2002 American Boat Restoration All rights reserved.